Receive a fun, delicious introduction to the world of Japanese cooking as you learn to prepare three of the country’s most-popular dishes during a 2.5-hour, small-group lesson. You can further add to the fun with an optional add-on of a beer and sake tasting. Start your class in the morning, meeting your guide at JR Morinomiya Station in Osaka and continuing on to the cooking studio. Start your class by following your instructor to prepare miso soup, a dish where subtle differences in technique can have large impacts on the final dish. 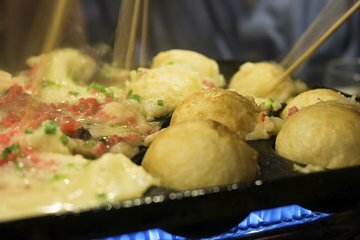 Then try your hand at making takoyaki—fried balls of wheat flour batter stuffed with octopus. You'll also learn to prepare okonomiyaki, a filling pancake made with egg, flour, cabbage, pork and dried bonito flakes. Once you’ve completed your cooking, enjoy your finished food with an optional sake and beer pairing, or simply sit back and savor the delicious flavors of your meal with the other guests. Before you leave, you'll also try Taiyaki (a fish-shaped cake) and Matcha tea. This class was very enjoyable and taught us some great Japanese foods. Yayo was an excellent teacher and guide for Japanese culture. They were so kind and gracious to our family and even gave us a souvenir bag with yummy goodies. I had a wonderful cooking class in Osaka last week. My host/chef was awesome, kind, funny and kept the food coming! It's hands on, which I really liked. You don't have to prepare the food just cook it how she shows you. You also get to take some home! I had some saki that was more like champagne! She has these containers that she keeps the saki in with pickled fruit and it's amazing. She also makes her own miso paste with her family and brings that in to cook with. Very authentic, very Osaka, and simply wonderful! Absolutely fantastic. Our experience was just perfect, definitely to not eat before as you will enjoy all the delicious food you learned to cook. Excellent experience. Much more than expected. Highly recommended. Our instructor was very knowledgeable and her dog delightful. The food was delicious. Yoyo and her dog Akane were two wonderful hosts! We went in her apartment in Osaka and she offered us tea and typical Osaka sweets. 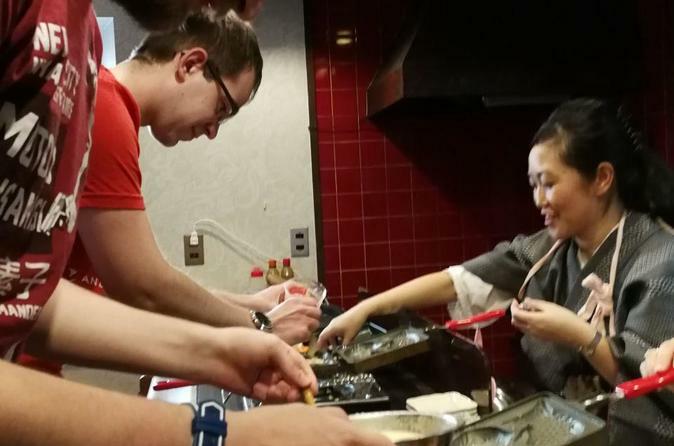 We then started the cooking class in which we learned how to make dashimaki japanese omelette, okonomiyaki and takoyaki. Yoyo was super nice and she answered all of our many questions. We chatted a lot about Japan and comparisons with Italy our country, food and habits. This is one of the nicest and most beautiful memories from our honeymoon in Japan. Thanks Yoyo! What a wonderful experience my daughter and I had ...Yayo meet us at the station and after a short walk we arrived at her apartment where we met the adorable Akane her little assistant/dog...we were given some sweet treats and then onto cooking. Yayo was a wonderful host explaining all the techniques and giving each of us an opportunity to cook...all up highly recommend this experience as the food is delicious and I cooked it myself! Yayo was an excellent host. She picked us up from the train station and it was a short walk to her apartment where we met her cute puppy. The course started with a tea ceremony where she presented us with a gift of chopsticks and holder. Then we moved onto making a variety of japanese food including the local speciality okonomiyaki and takoyaki balls. we also learned how to make japanese omelettes and accompaniments. It was an excellent afternoon and I highly recommend booking this in for your trip to Osaka. My daughter and I had an amazing time. Yayo was so hospitable and very talented. We did our best to make replica dishes but Yayo's were the best. We had lots of fun trying! We did the sake tasting as well and that was also good. Very worthwhile thing to do! The real Osaka! Thank you Yayo! So nice, Yayo (the chief cook) show us how to enjoy matcha tea, how to prepare miso soup, okonomyaki, takoyaki, sushi and also subtleties for dashi and Sojasauce. Do not take a breakfast before! This by far has been the highlight of my stay in Osaka. Yayo picked us up from the train station and led us to her apartment just a short walk from the station. There we were greeted by her assistant manager, the highly adorable dog Akane. Once inside we got to have a cup of Matcha before we started cooking. Yayo had a great balance of teaching and instructing. She would demonstrate the dish/ technique before encouraging us to make the dish for ourselves. She answered all our questions and kept the lesson fun. The homemade sake was a delicious treat and the added gifts were unexpected and very much appreciated. Yayo is an all around great person and instructor and I would love to have another lesson with her if she ever decides to have additional food options. She is a true gem of Osaka and this class isn't one to miss.